At AWC Industries – we know a thing or two about Wire Forming! Wire forming is a process required to bend metal and bring it to customized shapes for manufacturing processes. 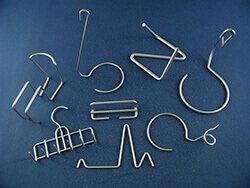 Custom wire forming is required in various industries, such as aerospace, construction, military and furniture sectors. AWC Industries specialize in high end wire forming and metal bending. We offer wire forming services for ferrous as well as non-ferrous substances such as aluminum, brass, copper, steel and stainless steel. Our state of the art CNC wire forming and fabricating facilities can produce the highest quality finished goods and we can bend and fabricate metal wires of up to 1 inch diameter. Specializing in high quality CNC wire bending and fabrication, we provide wire bending of ferrous and non-ferrous materials such as steel, stainless steel, aluminum, copper and brass. Utilizing only the finest CNC Forming equipment, our high quality CNC Custom Wire Forming is capable of handling high volume production runs, but can also handle small orders. Some of our typical products include push handles, counter top display racks, decorative wire forms, grids and wire grills. Our objective at AWC Industries is to provide fast and quality service to help you meet your production needs and get your products out to your customers! When you get in touch with us, we will try and understand your specific requirements and make sure that your project priorities are duly met with. By working with us, you can be rest assured that your technical projects will achieve the highest zenith of success. Our technical team can provide you with the best expertise in the industry, and you can expect your finished goods at the earliest turnaround time. Let the experts in Wire Forming handle YOUR next project. Contact us for a custom quote today!